Previous Belly Dance for Beginners Starts Thursday April 20! Belly Dance for Beginners on Thursdays Is Offering New Pricing! Thursday Belly Dance for Beginners is up and running at Janna’s! Classes are at 6pm. I am offering a great new pricing package to get you on the dance floor: 3 months of Belly Dance for Beginners for only $45 a month when you sign up on our auto pay program. Or purchase 12 weeks on or before your first day of class for only $115, a 15% savings. What a great deal! The new pricing also applies to the Saturday 12pm Beginner Belly Dance classes too. Want to really get your dance fit on? Take both classes for only $60 per month or $155. Thats 3 months of classes, two days a week and the best deal in town! 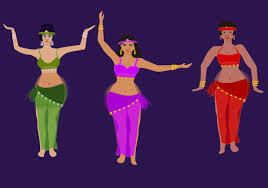 Stop staying in the lines…Belly Dance puts the curves back in your life! Give me a call at the number above if you have any questions.